Music lessons may rev up young brains enough to help close the academic gap between rich and poor, a new study suggests. Researchers from Northwestern University found that after two years of music lessons, the brains of kids from poor, gang-infested neighborhoods interpreted speech sounds more quickly and precisely, an improvement that might lead to better language and reading skills, according to the study published in the Journal of Neuroscience. The new findings come as tightening budgets have led more and more schools in poorer districts to chop arts programs, including music instruction, as nonessential to kids’ educations. Though earlier research had shown that music training seems to have a global impact on kids’ academic achievement, there was no proof that it actually affected kids’ brains. It’s been known for a while that underprivileged children’s brains seem to take more time to pluck words from the sounds they hear. That may in part be because poor kids hear fewer spoken words as they grow up compared to their wealthier counterparts, Kraus said. In fact, one study found that kids whose families were on welfare had heard 30 million fewer words by the time they were 3, compared to those with professional parents. Those from working class families fell somewhere in between. Practically, what this means is that if you sit a poor child in a classroom next to a youngster from a more advantaged home, the poor kid's brain will have to work longer and harder to turn the sounds she hears into words. So while the poor kid's slower processor is trying to make sense of the sounds, the more advantaged kid's high-speed processor helps her to grasp the words more quickly, allowing her time to mull them over and maybe even come up with questions. Parents don’t need to understand the mechanism to recognize that music training can work magic. 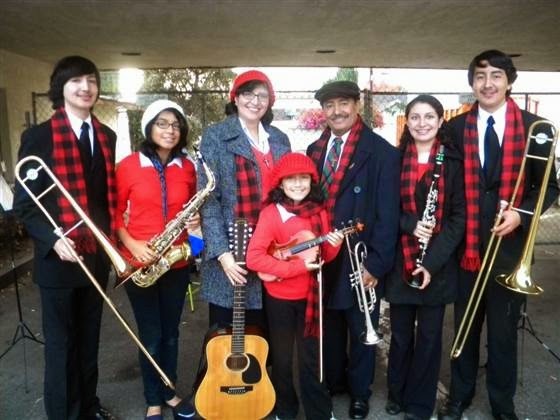 Jamie Morales is convinced that the music lessons his 13-year-old daughter, Liliana, received through the Harmony Project, which offers music education for youth in low-income communities, spurred her to achieve academically. Multiply that by five, and you’ve got the impact of music lessons on the Burgosfamily. Beyond that, music may have been the key to keeping her kids out of trouble. “Here in Los Angeles, it’s hard to keep your children occupied and to prevent them from joining the wrong crowd,” Burgos said. For the new study, Kraus and her colleagues randomly assigned 44 children aged 6 to 9 to either start music lessons immediately or to put the lessons off for a year. The children were tested at the beginning of the study, and then again at one and two years after it started, to see how quickly and precisely their brains could identify speech sounds. Once sounds come in through the ears, they must be processed and then interpreted by the brain as noise or as meaningful, Kraus explained. When the brain responds to sounds, it actually replays them, emitting brain waves that can be picked up by EEG sensors. Amazingly, those brainwaves, when passed through an amplifier, are very reminiscent of the signal that was originally picked up by the ears. So the brain, upon hearing a little bit of Mozart, will actually play back a version of those bars. What Kraus and her colleagues discovered was that with two years of music training, kids’ brains replayed speech sounds faster and more precisely than those of children with no music lessons or just one year of training. While music training may not be a “panacea” for the ills of poverty, “the study shows in a real-world setting that you can see significant gains in auditory processing and the physiologic basis for that,” said Robert M. Bilder, a researcher unassociated with the new study and the Tennenbaum Professor of Psychiatry and Biobehavioral Sciences and Psychology at the University of California, Los Angeles.